Impact of Insurance Expansion on Hospital Uncompensated Care Costs in 2014 Medicaid Buy-In Programs: Case Studies of Early Implementer States State Practices in Medical Child Support Cross-Program Coordination Community Action Agency Activities in Affordable Care Act Outreach and Enrollment: Insights from Case Studies How Many Individuals Might Have Marketplace Coverage at the End of 2016? In March 2011, Minnesota expanded Medicaid coverage to childless adults with incomes up to 75 percent FPL. 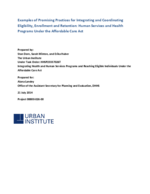 This represented an “early expansion” of the ACA’s increased Medicaid eligibility for adults. To quickly enroll eligible consumers, the state used two primary strategies. First, the Minnesota Department of Health Services (DHS) collaborated with hospitals to enroll eligible uninsured patients who sought care in hospital emergency rooms (ERs). Via a DHS-operated toll-free line, hospital ER staff could initiate their patients’ enrollment into Medicaid. Second, DHS provided Medicaid to participants in the state’s former General Assistance Medical Coverage (GAMC) program. The state’s IT system was not ready to handle this conversion, so state and county staff did the necessary work manually.